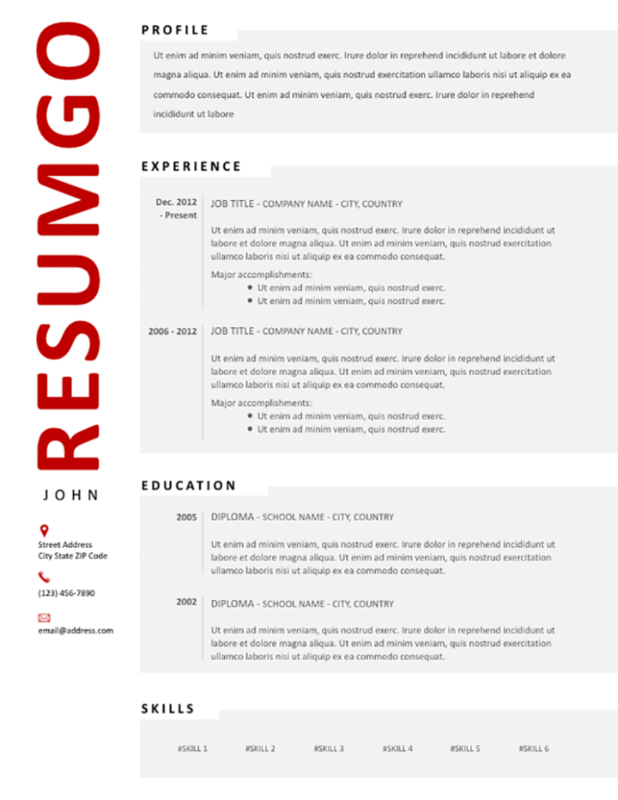 Hjarta is a modern resume template with gray blocks for each section. Two-column layout with a narrow left-hand sidebar, and red elements. In addition to being modern, this template is impressively clean and professional. On the left sidebar, your name oriented at 90 degrees, will be noticeable: it uses a dark red color, with an uppercase style and a very big font. Just below go your personal information. On the body, 4 blocks with a light gray background feature your profile statement or objectives, your experience, education, and skills. The dates on the left, are nicely separated from its corresponding information, making your resume very easy to read. The section titles, in white text boxes, overlap with style the top-left of each section block.